That’s how long you have to grab someone’s attention before they mentally drift off to the next thing. That’s one second less than a goldfish. Thanks to constant interruptions by smartphones and multitasking, our attention spans are getting shorter all the time. I wouldn’t be surprised if that average is even shorter in the fast-paced, 24/7 crypto market. Put simply, if you want to be a successful crypto speculator, you need to take a long-term view. We’ve discovered an alternative investment just as explosive as cryptocurrencies. We call them “Premium Shares,” and some of the best have soared to rare and exceptional gains as high as 4,697%… 1,499%… 4,142%… 1,945%… 2,463% — in as little as 8 months. For the next few days only, we’re sharing the details. The internet took 30 years to become mainstream. Blockchain technology is barely 10 years old and has only received serious attention for the last three years or so. Rewiring the global financial system and the larger economy takes a long time. Still, the Blockchain Ecosystem is developing fast. And it’s spreading like a virus. Eventually, it will take over all the aspects of our daily lives in which it makes sense to use a trust-minimized system. You see, nature is trending towards higher orders of complexity. In short, blockchain technology is peer-to-peer, immutable, and censorship-resistant. This enables us to build a freer, more complex society outside the limitations of nation-states. Building the future takes time. It’ll be another three to five years or so until cryptocurrencies reach mass adoption. But luckily, we don’t have to wait for this to fully play out to profit as speculators. 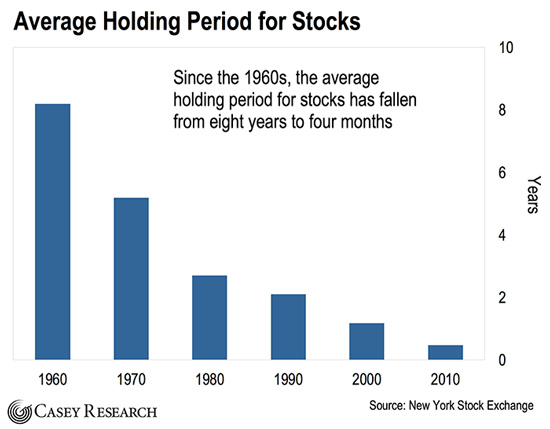 That’s because markets move in cycles. Each cycle brings in a new wave of cryptocurrency adopters. I deal with the Blockchain Ecosystem on a daily basis. So it’s easy for me to forget that there are billions of people on this planet that have never even heard of blockchain technology. I was reminded of this recently at Doug Casey’s estancia in Uruguay. We were having dinner with a cosmopolitan, affluent Uruguayan couple. She is a lawyer and real estate broker, and he is retired with a background in many business ventures, including being a stock broker at one time. In other words, they’re wealthy, educated people who travel the world… not local, isolated farmers. When Doug asked them what they think about cryptocurrencies, it turned out they had never even heard about Bitcoin. This goes to show that we still have a very long way to go. Most of the growth is still ahead of us. A crypto seed was planted in the Uruguayan couple’s heads that evening. 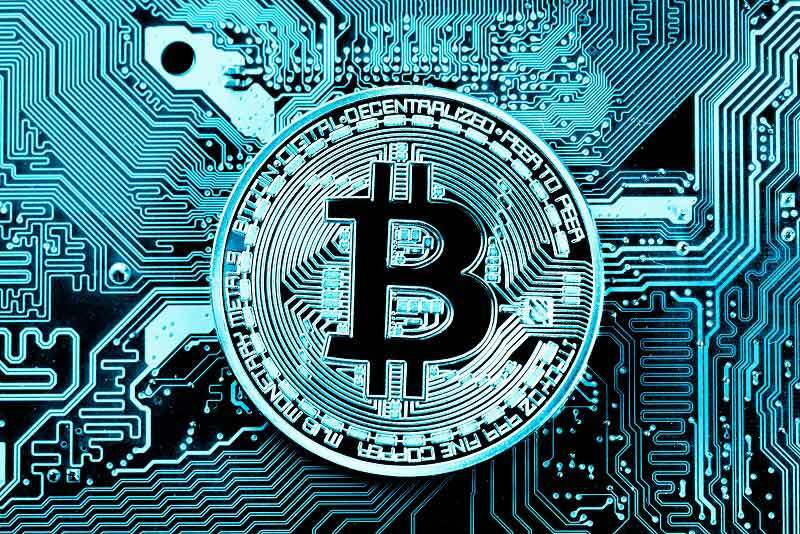 They might not investigate the topic much further right away… But two more people on the planet are now aware that cryptocurrencies exist and offer superior solutions to many problems. Think about that for a moment. Variations of this conversation play out thousands of times a day across the globe. 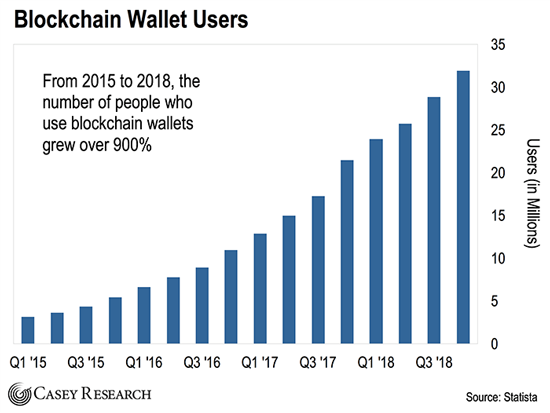 That’s why from 2015 to the end of last year, the number of people who use blockchain wallets grew over 900%. That means almost 29 million more people use blockchain wallets today than just four years ago. No matter if we are in a bull or bear market, the crypto meme is spreading and reaching more people. Even during the current bear market, more people learn about blockchain technology every day. The couple Doug and I talked to in Uruguay is a case in point. 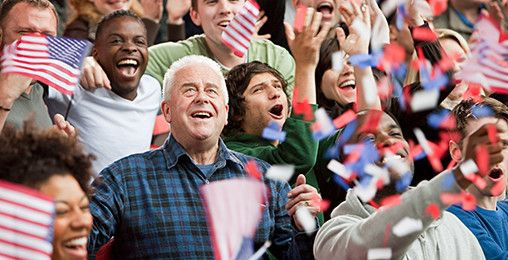 When the market eventually turns bullish again, this recently growing pool of new adopters will be ready to participate in the new world of the Blockchain Ecosystem for the very first time. That means when the next bull market starts, the network effects will be even stronger than the last time. Justin’s note: Marco says that “a rising tide lifts all boats,” and that will surely be the case in the next crypto bull market. But you always have to focus on quality projects. Marco uses his proprietary “T4” system to uncover the world’s best blockchain projects… ones that have the potential to become 300-baggers. 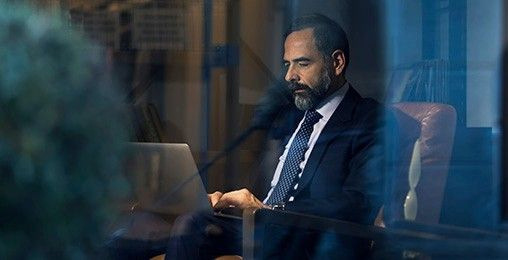 You can learn more about his research – and access all his under-the-radar picks – with a subscription to Disruptive Profits. Climate change is not caused by man. I believe it’s the Earth’s normal cycle. It has been up and down since the beginning of time. It’s a hoax that is nothing but a disguised attempt by the left to gain control over our lives. A total fabrication created by Al Gore. When Al went to D.C., he realized he needed more than his salary to live. At this point he created the global warming hoax. Then he created companies to combat global warming and received large government assistance. Bingo, his money problems are solved. In the Old West he would have been a snake oil salesman. The sad part is the government currently allocates roughly 553 million dollars to combat a problem that doesn’t exist. I do believe global warming “may” be occurring. However, we should not panic, and we should apply critical thinking to the problem. My rationale: Outer Space is -454 degrees Fahrenheit on some internet sites. In the future… we may have the technology to transfer any excess heat into outer space. This may be a heat transfer problem that needs to be solved. Do we spend trillions of dollars to “minimize” our carbon footprint? Or… do we spend trillions of dollars to solve a heat transfer problem? Or… do we create millions of more trees to reduce the carbon in the atmosphere? There are proposals in China to require all future high-rise buildings to have trees planted on the rooftops and exterior to reduce the carbon. It makes more sense to have all proposals on the table and then decide what makes sense. Doug, as one of my favorite radio commentators says, “Follow the money.” In the ’70s, some college professors predicted global cooling was going to cause an ice age. The colleges got millions of dollars from the government to find the cause. The obvious choice was atmospheric pollution by man. Why? Politicians loved it because they could pass regulations, thereby appearing to do something about the problem. Also gaining power for themselves. Researchers could get more money. The media loved it, because it gives them a never-ending source of stories to print/broadcast. They get more money. So the particles from combustion engines were the chosen culprit. But then something went wrong. The Earth started to warm up. The scientists needed more money to figure this out. The problem source couldn’t change, because the combustion engine was the perfect villain. So, CO2 became the perfect solution now. The funding and regulations went up exponentially. Everybody was happy. The politicians, the colleges, the environmental wackos and the media all got what they wanted. The rest of us don’t really count. I agree completely that AGW is not happening at all. Carbon dioxide is a trace gas that is essential to life on Earth but is only 1/27 of 1% of our atmosphere. It causes plants, grass, and trees – including crops – to grow. In return, they provide the oxygen that sustains life for all humans, animals, and sea creatures. If you consider CO2 an investment, the return is 540 times in oxygen. Joe D’Aleo – an associate of John Coleman – described the atmosphere as a 100-story building with CO2 as the linoleum on the first floor. Without that linoleum, the whole building would come down. I’ve lived in Portland, Oregon for the last 24 years. When I first moved here in 1995, it would start drizzling or misting during the last week of September and continue with mist or drizzle all day, every day until June. During the last five or six years, the “wet” season hasn’t started until well into October and there are a lot of days where it doesn’t precipitate for a few days at a time, and we even have sunny days in the winter! When it does rain, we no longer have mist or drizzle. We get downpours that sometimes stop traffic for a few minutes, then the sun comes out. It seems to me that the climate is changing. But I’m willing to consider other factors. CO2 recycles. An increase results in better growth of trees and plants. Real scientists say we had a tremendous quantity of CO2 in the atmosphere back in prehistory when lush growth of vegetation created our enormous deposits of coal. Unless we see a massive increase in volcanic action, we will never again see too much CO2. What are your thoughts on climate change? Is it a hoax, or something to be really concerned about? Tell us at [email protected]. Did You Miss Last Week’s Big Event? Thousands of readers showed up to hear what E.B. Tucker believes is the single best way to potentially make a small fortune this year. 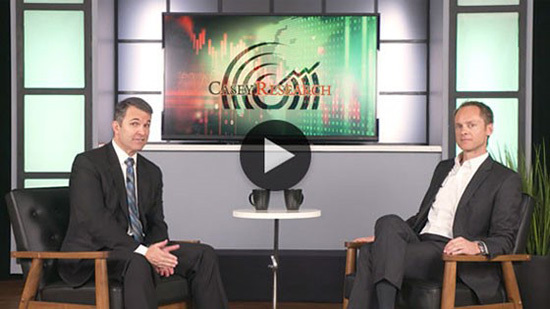 Legendary speculator Doug Casey has used this method in the past to help him make millions. You can get all the details right here.